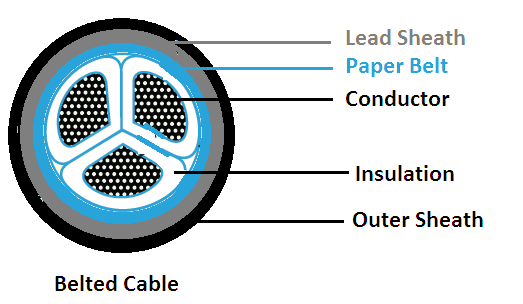 Core or Conductors: A three core cable has three conductors as shown in Figure. These conductors are made of copper or aluminum and usually stranded to make the cable flexible. Insulation: Each core or conductor is covered by a suitable thickness of an insulating material. The thickness of the layer of insulation depends upon the voltage rating of the cable. Inner Sheath: In order to protect the cable from moisture, gases, harmful liquids in the soil and atmosphere, a metallic sheath (known as the inner sheath) of lead, lead alloy or aluminum tape is provided over the insulation. Bedding: In order to protect the metallic sheath from corrosion and mechanical injury due to armouring, a protective layer of material like jute or hessian tape is provided over the inner sheath. This layer is known as bedding. This layer may be absent in some cables. Armouring: Over the bedding, armouring is provided to protect the cable from mechanical injury. Armouring usually consists of one or two layers of galvanized steel wire or steel tape. This layer may be omitted in some cables to avoid excessive sheath losses. Outer Sheath: The last layer above the armouring is the outer sheath. This layer protects the armouring from atmospheric conditions. Poly Vinyl Chloride (PVC): It is a thermoplastic synthetic compound. It is generally used to insulate the cables. It has a good dielectric strength (17 kV/mm) and maximum continuous temperature rating of 75oC. The PVC cables can be bent to smaller radii which make them particularly suitable for laying in industrial places. Due to a high dielectric, mechanical strength and exceptional resistance to moisture, the PVC cables have almost completely replaced the paper and rubber insulated cables in the range up to 11 kV. Impregnated Paper: Paper is a very good and cheap insulating material. But it is hygroscopic in nature due to which its insulation properties get destroyed due to the ingress of moisture. To resolve this problem it is impregnated with some compounds such as paraffinic or naphthenic material. The ends of paper insulated cables should always be kept sealed to make them moisture tight. Moisture can also enter through small pin-holes and crakes in the sheathing which may not be visible to the naked eye. Therefore, these cables are invariably metal-seathed to provide protection against ingress of moisture. It has the high dielectric strength (40 – 50 kV/mm) and continuous temperature rating of 80oC. It is used in high voltage power cable manufacturing. Cross-Linked Polyethylene: The cables using cross-linked polyethylene as the insulating material is known as XLPE cables. It is non-inflammable, light in weight, flexible, mechanically strong, moisture absorption resistant and have extremely high melting point. These cables are directly laid on soil bed and are used for the voltages up to 33 kV. Asbestos: Asbestos-insulated cables can withstand higher operating temperature than paper, rubber, PVC and varnished cambric cables. They are suitable for dry locations only as asbestos absorbs moisture. The operating temperature range is 100o – 200o depending upon the asbestos compound. Glass, quartz and silicon-rubber insulated cables are used where the operating temparature is above 105o. Thanks for reading about underground cables construction. #2 Which of the following Protects a cable against mechanical injury ? #7 . In a cable immediately above metallic sheath ………….is provided. #18 In capacitance grading of cables we use a………. dielectric. there is a danger of breakdown of insulation due to the presence of voids. 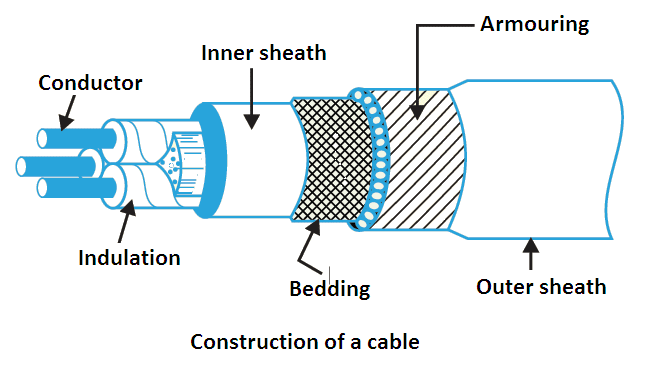 © https://yourelectricalguide.com/ underground cables construction.